White Labels’ Northern Lights strain achieved first place in a test conducted by the Spanish Cannabis magazine Cáñamo. 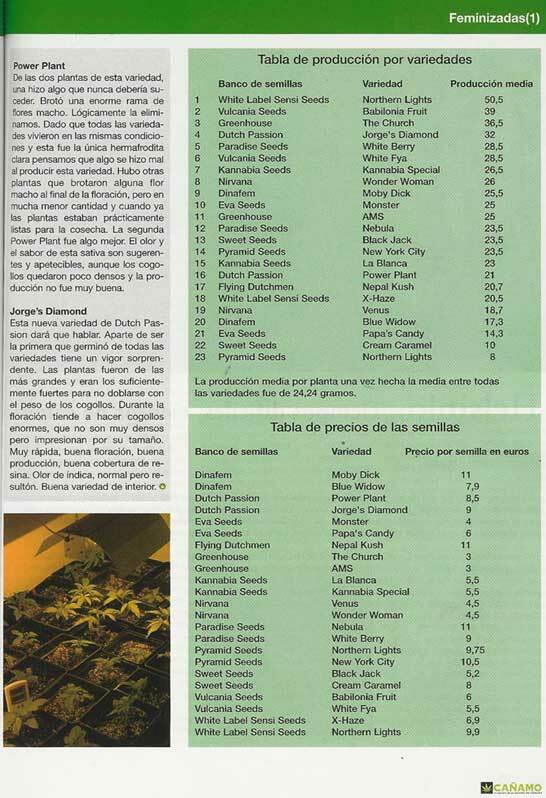 Cáñamo conducted a grow test of 23 feminised strains and published the results in their August issue. Ranking was determined by the yield of bud produced per plant. Northern Lights´ first place is especially noteworthy, as her yield was double the average weight of the tested varieties and around 30% greater than that of the nearest runner-up. White Label´s X-Haze achieved 18th place in this competition, which is a very respectable result for any Haze variety. Sensi Seeds recently announced they are now also have feminised cannabis seeds in their product range. The feminised strains they are now selling are bred from 5 of their most popular strains. “The idea is extremely attractive (feminised seeds ed.) – seeds that produce only female plants are a novice grower’s dream, eliminating the practice of sexing plants in the first weeks of flowering as well as the need to devote limited grow-space to unwanted males. Have a look at these new feminised Sensi varieties for yourself.